She sits her pen down and walks out the front door. 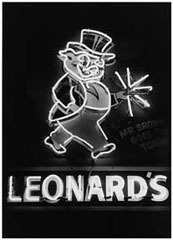 Around the corner, she slides the OPEN pig from its coasters, flips it and slips the CLOSED pig into place. The door opens and closes again. The key turns. The deadbolt cradles in the jamb. Inside, toothpicks settle. Hot sauce hugs the glass, lingering on the lip of the bottle, lazy as its Louisiana . 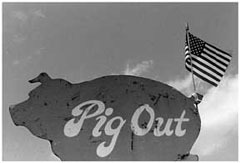 The pig above the counter wearing the words ORDER ME HERE! has no one left to persuade. Down the counter, the Virgin Mary and the black and white porcelain pig stare glassy-eyed from their still lives, watching while she wipes off the tables. As she works, the splatter patterns of sauce disappear. The rag fills with sauce. The fibers fade until the rag becomes a cotton copy of the sky, which out the window and down the street sinks slowly behind the Pyramid shifting in shade from white to pink. Today is the 29th of January 2003 . 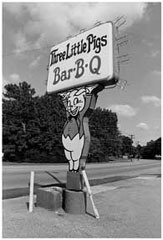 I’m here at the Little Pigs Bar-B-Q at the corner of Highland and Spottswood. With… can you say your name? 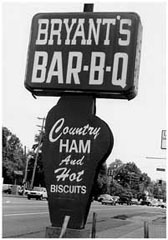 Were you born here in Memphis ? So how did you end up down here in Memphis ? No, no, no, my husband. 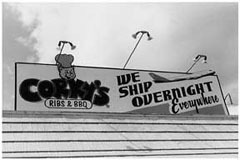 So, do you own this barbecue restaurant? Did you work here before you owned it? No. It was a case of I had gotten all of my kids in school and I was looking for something to do. I had five kids over at Memphis State , this place was available. So, we came in here and the kids went to school and worked here, studied here. How old were then when you bought this place? Oh, gosh. I’ve been here since ’81. I was forty-five, forty-seven. I don’t know. And you’ve been here since ’81. No. There was a man in here who taught us. Do you remember who that man was? His name was Ernie. I don’t remember his last name, but he had worked for the previous owner. Has this always been called Little Pigs? You just kept the name. Who owned it before you? I’ll tell you. I bought it from a man named Flemming and… [A customer walks through the door and stands at the counter. Beverly gets up and goes to take his order.] [from the counter]: Can I help you? Customer: A couple of barbecues. Regular or jumbo? Customer: Regular, extra sauce, mild. How are you? Good. And you? Customer: Oh, you know. [The sound of her tearing the ticket from the pad.] Six dollars. So, you were just telling me that you bought it from a man named Flemming. Yeah, but they hadn’t been here too long. They were just… It was like an investment. Before that there had been a man in here for about twenty-five years, who really established the place. His name was Pop Emerson. And then previous to that I’m not sure who started it. Can you tell me how strange was it… Or was it strange at all for you coming from Milwaukee to Memphis? Yeahhh [prolonged ‘yeah’], because I came down here in ’64. 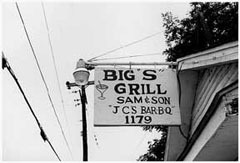 I bought the place in ’81, had never had a barbecue. 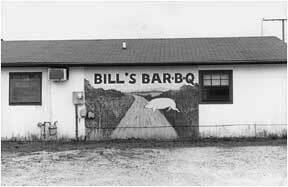 I had never eaten barbecue. When you bought this place. 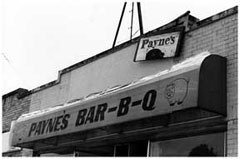 So, no barbecue in Milwaukee? Well, up there barbecue is ribs or you cook outside. No, they don’t have the barbecue sandwich. And so what kind of barbecue do y’all serve here? It’s pork shoulder. Customer [from his station at the ‘Pick Up Order Here’ window]: What kind? 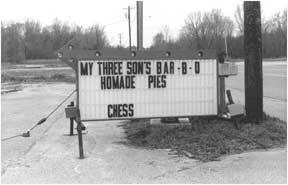 [he says as though he were speaking to some kind of idiot] They serve the best in Memphis. Customer: Best one I’ve ever eaten, and I’ve eaten at all of them. What’s your name? Customer: Roy Johnson. Roy Johnson. RJ: I’ve been eating here, how long? Oh, I don’t know. RJ: Twenty years I’ve been coming in here. Long as I’ve been here. Do you have anything you want to say . . .
RJ: Well, I’ve eaten barbecue all the way from New England to Florida… I live here in Memphis. 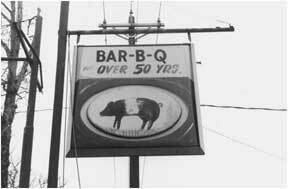 When I buy barbecue in Memphis, I come here. What do you like about it? What makes it better than everything else? RJ: It’s got a goood taste. It’s always had a good taste. 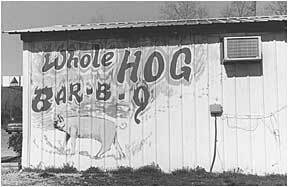 It’s got a good sauce and they always give you plenty of meat, they always give you good… You know, I’m not going to mention any names, but there’s some here in Memphis, I mean, you know, they’re saving their pork for something. They don’t put it on nothing, you know. [Beverly laughs.] It’s always been good here. Of course, my daughter went school at Memphis State and that’s what started us coming over here. We hadn’t stopped since. I like it. It’s been here since I think ’47 is when it opened. Smoke your shoulders. I mean, we do… We make our own sauce. It’s not ‘El Bottled’ and I think that’s probably the key. 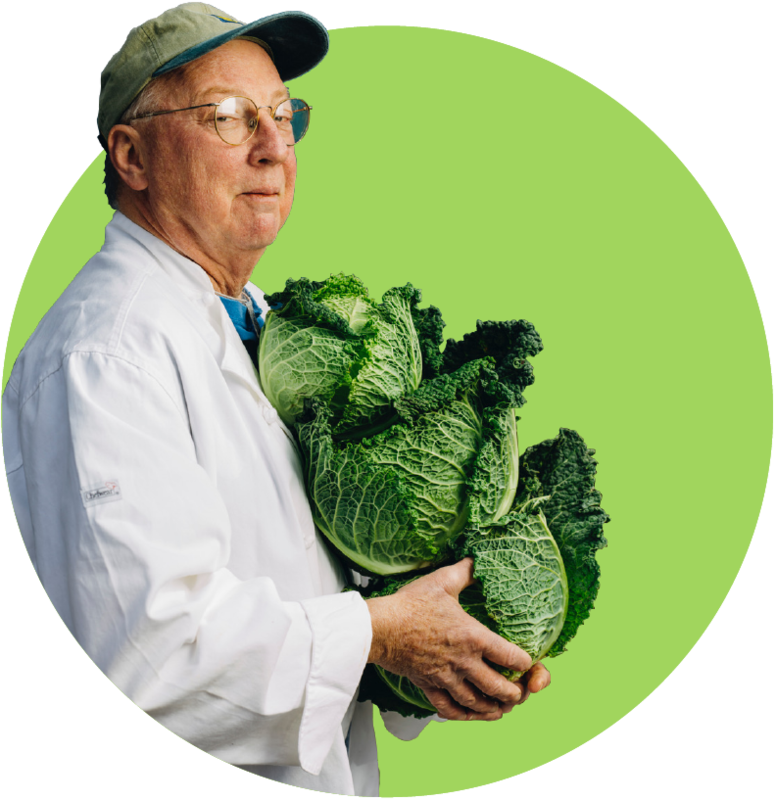 We make our own sauce for the slaw and it’s different than most people use. So, the combination, I think, is a little unique. 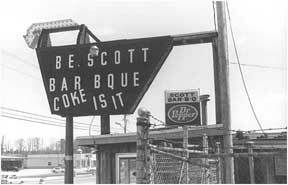 How different I don’t know because I can’t say I go eat barbecue anywhere else. Tell me about the process of you getting to know how to do this. Did y’all keep him on? I kept him for a couple of years. What happened, like I said, I had all these kids going to Memphis State that between all of them… You know, I was here all the time and they were coming and going and one way or another we were able to cover it. So, y’all work here together. Yeah, it’s just the two of us. All the kids are graduated and going on to jobs. It’s just us. Do you do the cooking or does he? How do y’all split up the work? Well, he does the meat, but I make the sauces. And the slaw and that kind of thing? Do y’all cook on an open pit? Not too much anymore. Now we’re using a cooker. It’s safer. One of these big, steel cooker things? Yeah, you’ve got better control. For the first ten, twelve years we did use the pits back there. You’d have pit fires and [she laughs]. It’s better. Now, you can smoke it, but it’s a controlled heat. You don’t have to worry about burning it. How long do y’all cook them? So, you start them in the morning? No we usually cook at night. So, with one of those cookers you can leave and go home and it’s fine. Yeah, but even when we used the pit we cooked at night. We’d bank it real good and make sure it was hot enough. It was, you know, like an oven. Was it a hard decision to go from the old pit to the new cooker? No. I mean, if you’ve ever seen a pit fire, if you’ve ever been called in the middle of the night by the fire department because your pit’s burning… No. It wasn’t hard. And, you know, as long as you can still get the same taste I don’t see why anybody would mess with the pit. People say, oh, you know, the smell, but I’m sorry, I don’t see that smell… It’s just so much safer. I mean, when you lose a big pit full of meat that cost you a lot of money. You can’t beat it. Or, have to clean the place because, boy, when that pit burned… You want to know what hell was like, open that door. I mean, the whole thing, that big, black thing back there. So, it’s just kind of off by itself now? Yeah. Well, the pit had big grates, you know, a big fire box, and when it would go, it literally burned from down here all the way out there and those flames would be licking out and you’d have to get a hose and you had all this black stuff… Uck! Flames coming out of the chimney? Oh, yeah! It would come out of the chimney, but you had to open the doors to get in there and you opened them and they would be would be licking out of that. You’d had to keep that door closed and get in there with a hose and start knocking it down. The first time it happened it scared me. I was standing there and all the sudden I heard this noise, you know, this whusssh! You know, like you see that movie Backdraft. Anyway, the guy working here knew what it was [and he yelled] PIT FIRE!! So, we run for the hose and you start… You really scramble. It’s scary. And so you just have to haul out all the charred shoulders and throw them away? Well, it depends on how fast you can get it knocked down, but you lose a lot. Were you ever scared that you were going to lose the restaurant when that happened? No. I don’t think so. I don’t know if you could because the pit’s on the outside of the building. Yeah, it sits out over there on the side. But it was something, like, if you had your shoulders on during the day, because sometimes we’d start them, you know… You’re always nervous. You’re always going over there to look because it just takes a little drop of grease on those coals an it’ll go up just like you strike a match. 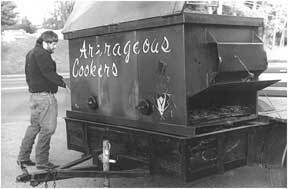 Well, this is a cooker, but it also has a place where you put your hickory in there so as it’s cooking it’s smoking. 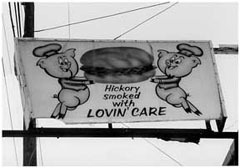 Where do get you r hickory? Just from a distributor? Chips. They just smell. I really don’t think it does that much because the shoulder is so big that it can’t penetrate it. I think it’s more in people’s minds because when you open that shoulder up, you know, that shoulder’s that big [holds her hands about eighteen inches apart]. Well, that stuff ain’t getting inside. But, you get the smell. But, people, you know, they think [laughs], but I don’t think it’s true. People never noticed a difference when y’all were transitioning from one to the other? Is all the decor the same as it was when you bought it? You’ve got these Saturday Evening Posts. Well, you know a lot of people dress their places up with all of these pigs and things. No, I never. I just like old advertising, especially drawing. If you go into magazines before the ’50s, most of your advertising was drawn, not pictures. I like to draw. I appreciate people drawing so I just got real hung up on the old advertising. My husband is an old car buff so we’ve got a lot of [advertisements of] the old cars. He wishes he owned them all. So, that’s just sort of where it went. So, this is the only Little Pigs that there is? The only one now. At one time we had four, but as the kids were getting out of school we closed them down because now there’s just the two of us. But at one time we did have four that the kids were kind of managing with employees. That was hectic. Where were your other locations? 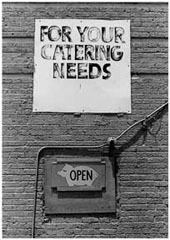 We had a little sandwich shop down on Madison. 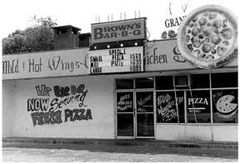 We had a place on Mendenhall and Knight Arnold and then for a year or so we were out at Humphry Center when it was first starting. Did you find it hard to compete with all of these other chains and things like that? To a point. I mean, this has been here and everybody knows it’s been here. Now, downtown was different, but that was because when we were down there, there weren’t many places to eat. 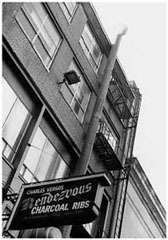 We were right across the street from the First Tennessee Bank building. It was like a captive audience so that was really good. But when you got out into these other places you were getting into a younger area who maybe didn’t go to school over here or didn’t know about it. So, you were really having to compete and none of them ever did as well as this. Did y’all advertise your stores? Not that much. And that was probably part of it, too. Right. No, we never did. Sometimes we’d put out a coupon, but no, we never did anything really strong in advertising. 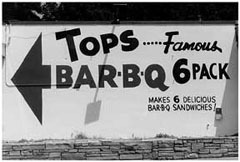 Do you know the story behind those murals on the side of the restaurant? And who was the artist? Oh, I don’t remember who he was. He used to own a comic book store. I don’t who it was. Was it your idea to do the little pig that you flip ‘Open’ and ‘Closed’? Yeah. That way people coming from that way can see without having to get out and come around. Thinking about that, can you just take me through a day for you here at the restaurant? We’re down here usually by about eight o’clock and it takes a few hours to get everything ready. Now I leave at four. 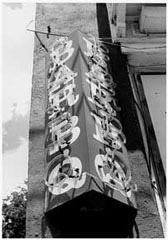 We used to stay open until eight when the kids were all here. But since it’s just the two of us and we’re getting up in years, we close at four. Plus the area is getting bad. I never used to be bothered by being here after dark, but now I’m a little concerned about it. Have you ever had any trouble in that way? We’ve had some break-ins. Not many considering, knock wood, but we’ve had a couple. In fact, one night the police man called us and woke us up at about two o’clock in the morning. They caught a fellow walking down over here carrying some of my beer and french fries? Something. So the police stopped him and they decided they’re going to look where it came from, so they came up here and sure enough he came in through a window. And they called us and we had to come down here, but outside of that it’s been pretty good. How have you seen this area change in the twenty years that you’ve been here? It’s… I hate to say it, but it’s going black and it’s just going down. How was it when you moved in? Well it was, you know, nice. You had a lot of older homeowners and everything down the street and around. And as they’re dying off it’s just changing, the economics of the area are changing. 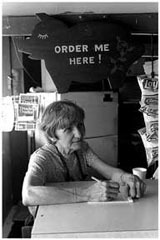 Do y’all have any customers that you remember fondly or maybe not so fondly? I personally don’t, but we’ve been told that Elvis came in here. That he was just getting started singing and he was working for I think it was Crown Electric. And they built the little church across the street here and he used to come in here with his boss at lunch. They were putting the electric on the little church across the street. That was in the ’50s, whenever the heck it was. Why do you think your children decided not to continue to do the restaurant? Too hard work. But, you know, they have educations. Eight to Five jobs make a lot more money with a lot less effort. They’re into computers. I got a couple who are in sales for GE. You know, they didn’t need to go to college for four years to do this. Do you think it will stay in your family when y’all retire? No. Probably when the time comes, we’ll sell it. Like, my youngest son, he’s been here since kindergarten. He basically lived here because I was working so much. He works here Saturdays during school, worked summers when he was in college, and he’s sick of it. They didn’t want to be this tied down to something. It’s not hard, you know, but it’s time consuming. 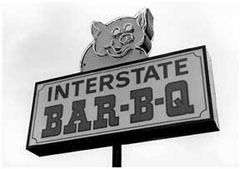 Do you go to other barbecue restaurants to see what they’re up to? No. Don’t care. I mean, I do what I do, if they like it, fine. If they prefer somebody else’s to mine, you know. I think everybody sells a pretty good sandwich, you know. It’s all in taste. I mean, how much can you do? Like spaghetti sauce or pizza, you either like it or you don’t. You can’t please everybody. Do you just have the one sauce? No, I have a hot and a mild. It’s basically the same sauce, I just make it a little hotter. It’s from scratch. I don’t know what anybody else does. But I think most people as far as I know do work with a bottled sauce. Now, if they doctor it or not, I don’t know. This is how they were doing it when I came here and I’m not messing with it. It would be easier to work with a bottled sauce that I could just order in and serve, but I’m just not going to do that. 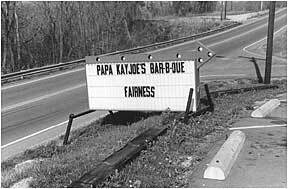 Do you think the barbecue business in general is a hard life? Time consuming. I mean, you spend a lot of hours down here. Like I said, we’re here at eight o’ clock and when I first bought it we were here seven days. And then I said, you know, I got to have one day off. It’s real time consuming. But at this point in my life I don’t care. I got nothing better to do. Do you get to go off and take vacations or do you just stay here? Have you been back to Milwaukee much? Oh, I’ve been there but it’s just in and out. 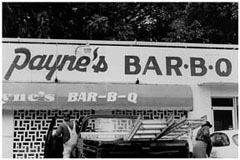 I just think that it’s so interesting that you’re from Milwaukee and ended up here in Memphis running a barbecue restaurant. Do you ever think about that? No. I wonder if it would work up there. You know, you get into regional tastes and I just don’t know because I’ve been down here how long and, God, don’t talk to me about cornbread. I mean, I’m sorry, that’s not what I was brought up on and I’ve tried it and I don’t like it and I’ll never like it. 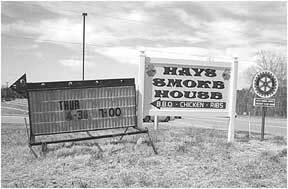 Are there other aspects of southern cuisine that you just don’t like at all? I’m not particularly crazy about southern cooking in general. I think it’s very bland. Grits, I think you should put wallpaper up with. I think it’s… Gah! I like vegetables. I’m not a big meat eater. But being from up north we had more… You probably ate more beef. Pork, if you ate pork you were eating more like pork chops or pork roast. More seasoning, you know. Stews. When I think of Milwaukee, I think of those big bratwurst and things like that. Absolutely. Bratwurst or Italian sausages. I mean, it’s like down here what they call pizza… Oh my God. I mean, you got to go up north or go to New York or Chicago to get pizza. For some reason down here, and I don’t know why, spaghetti, pizza, they all have a sweet tasting sauce. You go up north, it’s spicier. You don’t get that sweet taste. I mean, I don’t know. It’s just different. It’s was sort of funny to most people. Most people just, you know, ‘Why are you’ you know [down here?] And I’d tell them the truth. 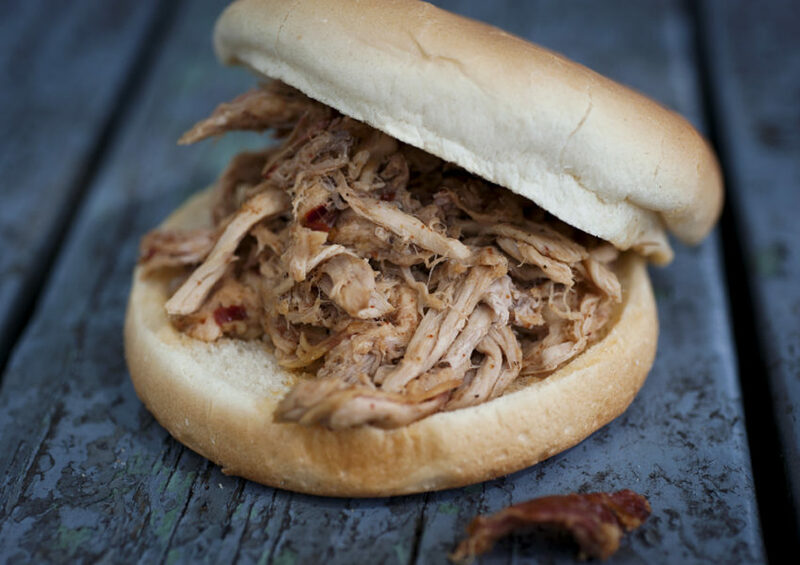 It never bothered anybody that I wasn’t a good old Southern girl who did barbecue all my life. They were happy with what they got. So, I am what I am and everybody knows me. And you get a lot of people now who have been into these areas and come and are quick to talk about ‘Oh, I’ve been to Milwaukee. I’ve been to Chicago.’ And especially snow. You know, ‘I was up there and I really saw snow.’ Not this whatever they get here, an inch of snow and they close the schools. I mean I trudged through snow three feet high walking to school, you know. This here is ridiculous. Well, [snow] is a big thing for us. We’ll buy all the milk and bread in the world and just sit at home. What amazes me is how people drive in it. They speed up. Nobody knows… And they’re all over the street. [Laughs.] It’s the funniest darn thing you ever saw. Well, tell me how many shoulders do y’all serve in a week? Now, because it’s slower, we’re probably about fifteen or twenty. But we used to do forty-five or fifty. I mean it’s dropped off that bad. But now we’re working half days. I think it drops off a little in the summer and what you find is that they’ll eat a barbecue, but it might just be a sandwich. They don’t eat as much. So, there are lean times every year? Yeah, but when you get into your holidays it picks up. No. I don’t want to be responsible for anybody else’s food. I don’t do them and try to sell them. When we first came in we cooked turkeys for people and I just didn’t like being responsible for somebody else’s food, so I stopped. Do y’all do anything else other than the shoulders? Oh, you know, hamburgers, Polish sausage, bologna. Well, when you get everything hot enough. You don’t want to flip that until you’ve got everything ready to go. You know, you go through your lunch and then it gets slow. Like now it’s dead as a doornail. I don’t know what it is. But you have a slow period until about three or three thirty, you know, when you might do a little bit. About fifty-fifty. Depends on the weather a lot. Well, I don’t have anymore questions to ask you unless you just want to tell me something that you think I should know about this place. Nope. It’ll probably be here til the building falls down, [laughs] which might be soon. Do you think your husband would want to talk for a minute? DM: What do you want to know? 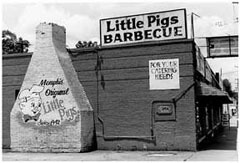 I just wondered if you could give me your take on coming from Milwaukee and becoming a barbecue cook in Memphis. DM: Well, you know, naturally… Did you tell him why we had taken this? He’s only been working here with me for four or five years. Up until that time it was me and the kids. DM: The reason why we picked up this place is she wanted something to do after [kid] number seven was in first grade. Did you tell him that? Oh, yeah! That’s, like I said, that’s why I was able to do it. DM: The reason to take the restaurant is so they’ll [the kids] have a place to work, you know, and go to school. And she can work it as well. So, this was really a saving grace. I mean, it was like a revolving door. Come time for them to get their classes we’d have to sit down and make sure everything was covered here. Yeah, it was just very convenient at the time. What was he doing? What was his work? Did y’all ever do contests or that kind of thing? No. See, like the barbecue contests, you don’t see any businesses go in there. I don’t even know if you can. But if you are running a barbecue shop, I don’t think you can compete. What happens, a lot of people go down there and win and then they go into business. Maybe I could sponsor a team, but I’m not real sure about that either. Is that even something you want to do? Oh, gosh no. Oh, Lord, heavens no. You go down there… My one son, because of this place, got to be a judge. Ok? He was down there all Saturday judging barbecue. Came back out here drunk as a skunk. Ok? He’d been drinking all day. He was telling how you taste it and they give you something you’re supposed to wash your mouth out, you know, before you go on to the next one. He says, ‘Believe me, after two or three you can’t taste anything.’ Now here I got this kid who says he can’t taste anything, he’s also half looped, and he was judging this thing. How fair is it? How did he get picked? They contacted him because he worked here. So that made him an authority. Yeah, yeah. And I thought, any business who puts itself on the line to go down there is crazy, plus it’s very expensive. It’s like thousands of dollars, right? DM: You want a Pepsi or something? I’m going to get a sandwich and something to drink in just a minute after we get finished talking. DM: You want it now? Yeah, why don’t you go ahead and make it for him. I guess I could go ahead and order one. DM: It’s on the house. What a regular mild, or a hot, what do you want? A regular hot, no slaw. I don’t know about this slaw. I grew up in northeast Alabama and there was no slaw. No slaw, or if it is, it changes. I hear you get a hundred and fifty miles away and it changes. North Carolina supposedly has a bunch of slaw up there, too. I remember the first time I ever got a barbecue sandwich with slaw on it. I was really… I felt tricked, you know. Well, I had a friend in town last week and… She was from Boston and I was taken her back to the airport. 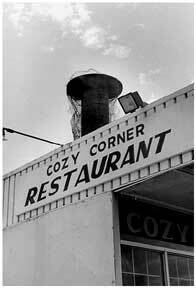 And we stopped over at the Cozy Corner to get a sandwich right before she took off and I knew to ask about the slaw. You know, I asked if it came with slaw on it and they said yes I said that I didn’t want mine with slaw. And when she… See, she’s from Kentucky originally, so I figured she knew about this slaw thing that was happening. And, I had just asked. And then he said ‘Well, what do you want?’ And she said ‘a sandwich.’ And he said ‘Do you want slaw on it?’ And she, ‘Well, yeah, I’ll have some slaw.’ But then when she got it she realized that he meant it was going to be actually on the sandwich. Well, if you’re brought up here, you know, they know it. And I’ve got a sign up that says ‘You get slaw unless you otherwise say so’, because the city is getting more people from other places who don’t know it comes with slaw. 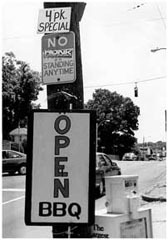 So, I hate to ask everybody so I have this sign. And, you know, I like the slaw, but I just don’t like the combination. I wasn’t born and brought up by it, so. Well, I mean, yeah, but you can take it off. But, yeah, it’s different. 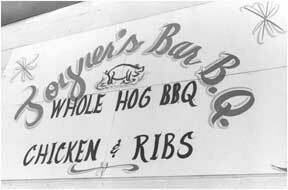 I’m from a city where there’s a tavern on every corner and then you come to Memphis and there’s a barbecue shop on every corner.